Ah, the ancient art of rhetoric. There’s no escaping it. Variously defined as “the art of argumentation and discourse” or, by Aristotle in his fragmented treatise, as “the means of persuasion [that] could be found in the matter itself; and then stylistic arrangement,” rhetoric is complicated. Aristotle’s definition further breaks down into three distinct types, and he illustrates each with literary examples. And if you’ve ever picked up a rhetorical guide—ancient, medieval, or modern—you’ll be familiar with the lists of hundreds of unpronounceable Greek or Latin terms, each one corresponding to some quirky figure of speech. Well, as usual, the internet provides us with an easier way in the form of the video above of 10 figures of speech “as illustrated by Monty Python’s Flying Circus,” one of the most literate of popular artifacts to ever appear on television. There’s “paradiastole,” the fancy term for euphemism, demonstrated by John Cleese’s overly decorous newscaster. There’s “epanorthosis,” or “immediate and emphatic self-correction, often following a slip of the tongue,” which Eric Idle overdoes in splendid fashion. Every possible poetic figure or grammatical tic seems to have been named and catalogued by those philosophically resourceful Greeks and Romans. And it’s likely that the Pythons have utilized them all. I await a follow-up video in lieu of reading any more rhetorical textbooks. Is this wrong? 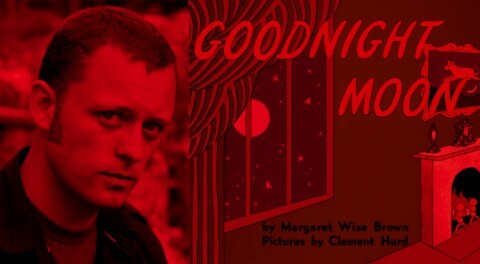 Benjamin Percy (author of the werewolf thriller Red Moon) takes the sweet children's bedtime story, Goodnight Moon by Margaret Wise Brown, and turns it into a story that will keep kids (and maybe adults) awake for days on end -- perhaps leaving parents no choice but to have the real Werner Herzog read Go the F**k to Sleep. This recording comes courtesy of Graywolf Press, and don't forget to look under your bed. American movie stars have long found work across the pacific in Japanese television commercials: Nicolas Cage, Paul Newman, Dennis Hopper, Harrison Ford, Jodie Foster — the list goes on. If their spots aired stateside, we'd probably buy what they sell too, but celebrities in their image-protective league have thus far shown a reluctance to endorse products in their own country. Japan's ad industry hasn't only sought the participation of America's big-name actors, though; it's also gone after the directors. At the top, you'll see one featuring a filmmaker never afraid of exposure: Pulp Fiction auteur Quentin Tarantino taking a turn in local costume (and alongside a talking dog) in a commercial for Japanese cell phone service provider Softbank. Just below, we have Orson Welles, he of Citizen Kane and British frozen-peas narration alike, in a spot for G&G Whisky. "I direct films and act in them," Welles says by way of introduction. "What we're always trying for is perfection, but of course, that's only a hope. But with G&G, you can rely on it." It may put you in the mind of Sofia Coppola's Lost in Translation, wherein Bill Murray's character famously turns up in Japan to shoot a whisky commercial of his own. Makers of that beverage have shown quite an interest in the imprimatur of cinema's luminaries, Eastern as well as Western. We've previously featured a Suntory commercial including not just The Gofather and Apocalypse Now director Francis Ford Coppola, but Akira Kurosawa, the maker of Rashomon and Seven Samurai, known in his homeland as "the Emperor." It makes you wonder: do we in America know our directors well enough that they could sell us things? Then again, the Japanese did enjoy all those old Woody Allen Seibu spots when most of them still hadn't a clue about the beloved filmmaker's identity. Read a full transcript of the letter below. 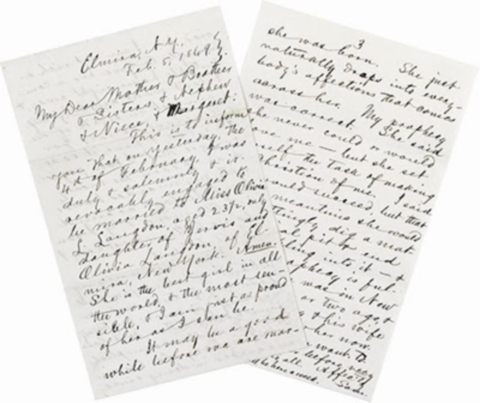 This is to inform you that on yesterday, the 4th of February, I was duly & solemnly & irrevocably engaged to be married to Miss Olivia L. Langdon, of Elmira, New York. Amen. She is the best girl in all the world, & the most sensible, & I am just as proud of her as I can be. It may be a good while before we are married, for I am not rich enough to give her a comfortable home right away, & I don't want anybody's help. I can get an eighth of the Cleveland Herald for $25,000, & have it so arranged that I can pay for it as I earn the money with my unaided hands. I shall look around a little more, & if I can do no better elsewhere, I shall take it. I am not worrying about whether you will love my future wife or not—if you know her twenty-four hours & then don't love her, you will accomplish what nobody else has ever succeeded in doing since she was born. She just naturally drops into everybody's affections that comes across her. My prophecy was correct. She said she never could or would love me—but she set herself the task of making a Christian of me. I said she would succeed, but that in the meantime she would unwittingly dig a matrimonial pit & end up tumbling into it—& lo! the prophecy is fulfilled. She was in New York a day or two ago, & George Wiley & his wife Clara know her now. Pump them, if you want to. You shall see her before very long. P.S. Shall be here a week. 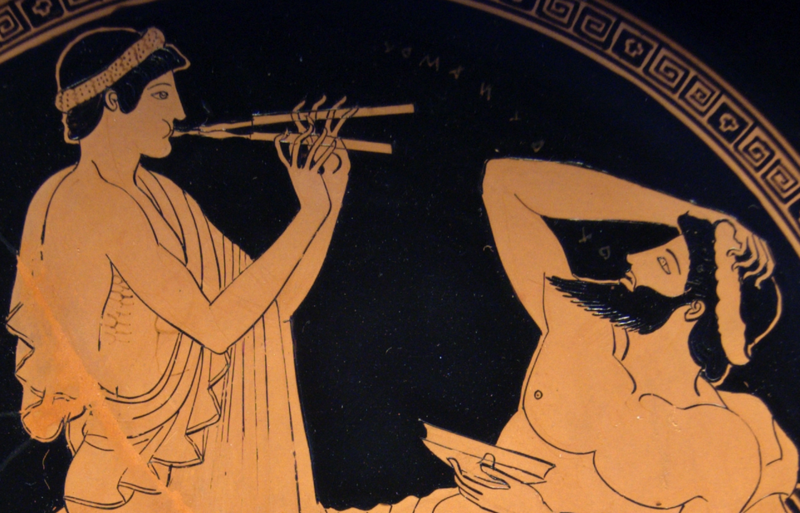 Between 750 BC and 400 BC, the Ancient Greeks composed songs meant to be accompanied by the lyre, reed-pipes, and various percussion instruments. More than 2,000 years later, modern scholars have finally figured out how to reconstruct and perform these songs with (it's claimed) 100% accuracy. So what did Greek music sound like? Below you can listen to David Creese, a classicist from the University of Newcastle, playing "an ancient Greek song taken from stone inscriptions constructed on an eight-string 'canon' (a zither-like instrument) with movable bridges. "The tune is credited to Seikilos," says Archaeology Magazine. For more information on all of this, read D'Angour's article over at the BBC. One night in October of 1938, listeners tuned into CBS radio to hear a piece of radio theater (listen below) so frightening and, for its time, realistic, that people across New England and eastern Canada fled their homes to escape danger. Or so the legend goes. 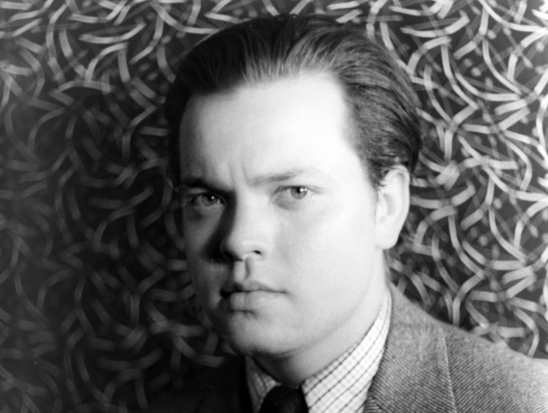 With Orson Welles reading the part of an astronaut and professor, the Mercury Theatre on the Air’s broadcast of War of the Worlds hit a frayed nerve in the American public. The show aired during the tense years leading up to World War II, when fascism was on the rise in Europe. Many took the “news” of an alien invasion for truth. It would have been easy to be fooled: the story, adapted from H.G. Wells’ early sci-fi novel, was written as a simulated news broadcast. 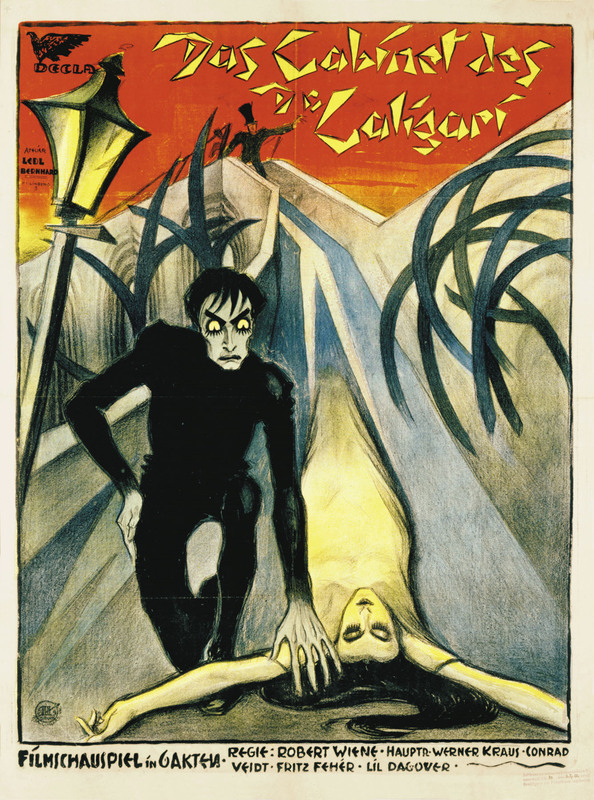 It opened with an introduction from the novel and a note that the adaptation was set a year ahead (1939). For those who missed that disclaimer, the remainder of the show was unsettling to say the least. A reporter read a weather report. Then came dance music played by a fictitious band (“Ramon Raquello and his Orchestra”) that was interrupted by news of bizarre explosions on the surface of Mars. Soon Orson Welles made his appearance, interviewed as an expert who denied the possibility of any life on the red planet. But then came the news of a cylindrical meteorite landing in northern New Jersey. A crowd gathered and a “reporter” came on the scene to watch the cylinder unscrew itself and reveal a rocketship inside. Welles offered another disclaimer at the end of the story (when the aliens succumbed to Earth’s pathogens) to remind listeners that the broadcast was fiction. Too little, too late? Or just great theater? The next day, Welles held a brilliant news conference where he apologized for putting a fright into listeners. (It's another great piece of theater.) Meanwhile the broadcast established the Mercury Theatre on the Air—already an acclaimed stage production company—as one of America's top-rated radio programs. Until then the show had languished in relative obscurity. After sending thousands of people into a panic, the show earned advertising sponsorship from Campbell’s Soup.